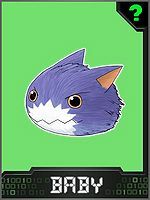 A Slime Digimon whose whole body is covered in the tough fur "Mithril Hair". It manifests an aggressive personality immediately after being born, and despite its fangs not yet being grown, it opens its mouth wide and completely intimidates the opponent with the manner in which it snaps at them. Because of this, there exist many Digimon which are completely deceived, but it is still a rare Digimon. If an opponent approaches, it spits "Chīsana Tetsu Tsubu" from its mouth. Despite its fangs not yet being grown, it intimidates the opponent with the manner in which it snaps at them. Special Move: Attacks by spitting from its mouth (Chīsana Tetsu Tsubu). From Dodo (ドドッ‎), the onomatopoeia for rumbling. 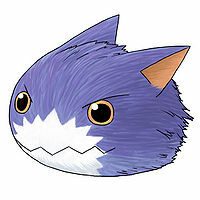 Anime/Manga Digimon World Re:Digitize Encode: "Foment"
Chīsana Tetsu Tsubu  Little Iron Beads 小さな鉄粒 N/A Attacks an opponent that approaches it by spitting small iron beads. 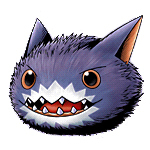 He is the first Baby form for DORUmon and is Doumoto Kouta's partner, appearing only in the booklets of the manga. 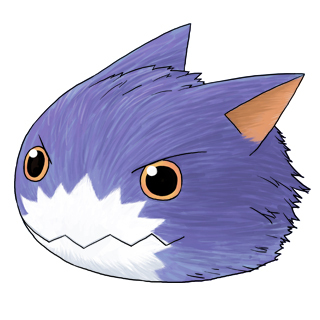 Dodomon is an obtainable Digimon which is hatched from the blue DigiTama, and evolves into Wanyamon. It can also be obtained as a collectible card. Its card is part of the Cute Children (かわいい子供たち Kawaī Kodomotachi) set. Dodomon is available as a Digimon Medal. 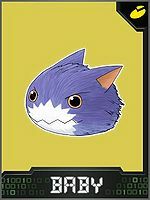 Dodomon is available as a Digimon Card. This page was last modified on 24 January 2019, at 04:28.